Bethlehem Steel FC announced today the signing of 19-year-old Academy senior center back Benjamin Ofeimu. Keystone Sports & Entertainment now has all five of its professionally experienced center backs signed to actual professional contracts. Ofeimu exemplifies Tanner’s conviction that the Philadelphia Union Academy has teenagers in its ranks who are ready to play soccer professionally against men. 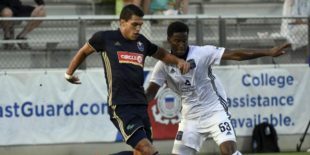 On June 2, 2018, he started for his first professional appearance against North Carolina and scored the equalizer in Bethlehem’s season-foreshadowing 2-1 comeback at Cary, NC’s Sahlen’s Stadium. Throughout the season thereafter, Steel head coach Brendan Burke would consistently mention that when Big Ben played Bethlehem did not lose. Ofeimu’s streak ended only in October in the conference playoff semi-final against eventual USL Cup winner Louisville. But in the match, the league’s leading scorer was so frustrated that Louisville’s coach took him off the pitch midway through the second half. Cameron Lancaster, now signed by Nashville to an MLS contract, had been Ofeimu’s primary mark. After the season coach Burke described his young defender as knowing exactly what he wanted and working hard to achieve it. By physical standards, Ofeimu is the prototypical centerback. Not only is he 6’3”. He weighs a lean 200 pounds and uses it to restrict the enthusiasm of opposing strikers. The 2019 Steel have added a defender.